Hi everyone! We're currently at Worldcon (and having a fantastic time), but I wanted to mention something that we talked about this morning at the SFWA business meeting. Over the course of this next semester, we plan on redesigning and improving our Speculative Speakers service, in order to enhance its usefulness for both those who wish to speak, and those who wish to hire speakers. If you haven't already heard, AboutSF is leading a teaching workshop for Worldcon 71: LoneStarCon3. The Teaching SF Workshop will take place on Monday, September 2nd from 9 a.m. to 2 p.m. in the Henry B. Gonzales Convention Center and will feature an introduction by Worldcon Guest of Honor Dr. James Gunn. The workshop is designed to give teachers, librarians, young adults, and parents the materials they need to teach SF to anyone, anywhere! Check out the Teaching SF Workshop page for more information! Hello everyone! Here are the discussion questions for tomorrow's livestream for Ender's Game. We're really excited to talk about it, and we'd love to hear your responses to some of these before we get started tomorrow. As many of you know, Ender’s Game is being released as a film on Nov. 1, 2013 with author Orson Scott Card as co-producer. After many attempts to make the novel into a film before (and it’s underwhelming release as a comic book by Marvel), this is finally happening. Fans everywhere are thrilled, but a bit…well, concerned. 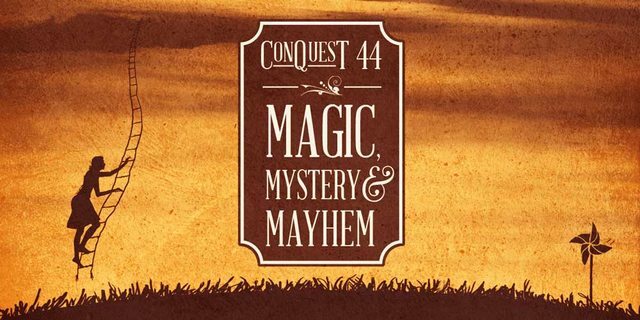 ConQuest, Kansas City's annual Science Fiction convention, is in just a couple of weeks! The con runs from May 24th to May 26th, and Mackenzie and I will both be there, along with the CSSF Director Chris McKitterick. If you're in the KC area, check it out. If you're already attending, be sure to look for us! COnQuest also holds a Charity Auction every year, the proceeds of which directly benefit AboutSF. Have you ever looked up at the night sky and wondered...who's out there? Is anyone else seeing the same sights in the same way? How tiny and insignificant must we be compared to the vastness of space? Of course you have! Likely, you read SF to answer these questions or write SF to evoke these questions in others. As part of our impending site redesign, AboutSF has teamed up with astrophotographer Robert Arn to evoke this sense of wonder on our own website.